Scott Weighart previews the 2018-19 Terrier squad that will look to leverage team speed and experience at forward, defense and goal. Like the Terriers, MSU recorded a convincing exhibition win a week ago, thumping Mount Royal, 7-3. Despite losing their two top scorers from last season, the Mavericks have a strong offense led by juniors Marc Michaelis (18G, 22A) and Parker Tuomie (9G, 28A). Four starting defensemen return, led by junior Ian Scheid (26 pts), but goalie is a different story. 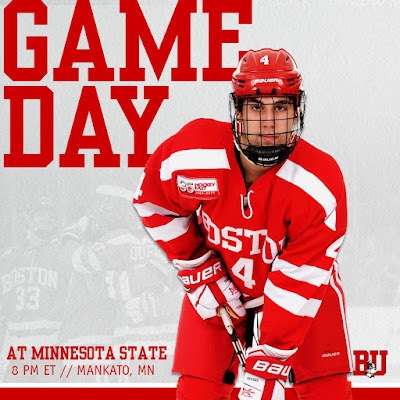 Former Terrier Connor LaCouvee, a standout last year as a graduate transfer, and his back-up both are gone. Freshman Dryden McKay and graduate transfer from Northern Michigan Mathias Israelsson (2.84 GAA in 11 games last season) will battle for the starting job. 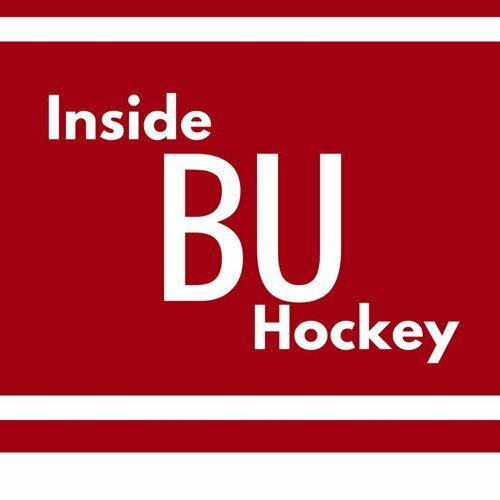 Episode #1 of this season's Inside BU Hockey features Bernie Corbett's conversation with O'Connell, the 12th Terrier head coach and, like predecessors David Quinn and Jack Parker, a former BU captain. ►ESPN’s Chris Peters previews the college hockey season, top NHL prospects, top freshmen and Frozen Four picks. 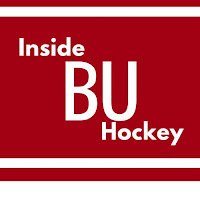 Peters has BU in the Frozen Four, while John Buccigross does not. Both have Ohio State and Providence reaching Buffalo. 2021 recruit Roman Schmidt, a 6’4” right-shot defenseman with the Don Mills Flyers Minor Midget AAA, is profiled by Prospect Pipeline. A dual US/Canadian citizen, he’s currently ranked #4 for the upcoming OHL draft by Prospect Pipeline—just ahead of fellow recruit classmate Danil Zhilkin—and is considered a lock for next season’s NTDP U17s. With his first two NHL goals and an assist, Brady Tkachuk had a hand in Ottawa’s first three scores, but the Senators dropped a 7-4 decision to Philadelphia. Tkachuk is the 83rd Terrier to play in the NHL. David Quinn notched his first win as an NHL head coach as the Rangers edged the Sharks, 3-2 in overtime. Matt Grzelcyk had a pair of power play assists in the Bruins’ 4-1 win against Edmonton. Colin Wilson scored his third goal of the season as the Avalanche thumped Buffalo, 6-1. Terriers play their first road game Friday night at Merrimack with puck drop set for 7 p.m. BU last played at Lawler Rink on January 25, 2018 and came away with a 5-1 win. Terriers have a 7-2-0 all-time mark against the Warriors. Krys didn't make the trip. Lower body injury. Precautionary. Amonte could play tomorrow.